You know where I learned some important ethical lessons? Watching Star Trek. 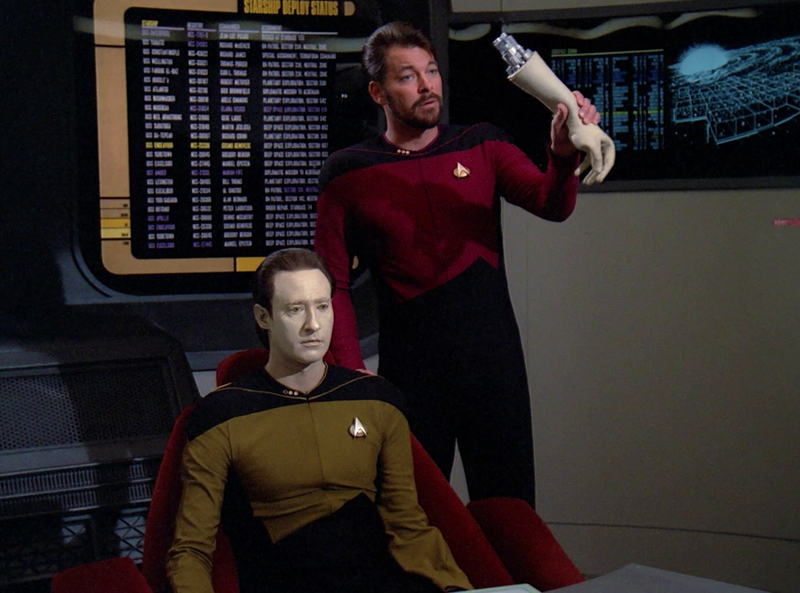 The Next Generation in particular has some great material – “The Measure of a Man” is a classic, debating Data’s humanity, and there’s even an episode titled “Ethics” in which a physician’s interest in collecting research data puts a patient’s life in danger. But even beyond “the final frontier,” there has been a huge amount of media over the years – television episodes, films, novels, short stories – that has used speculative fiction to make us think about important ethical questions. Previously when teaching a class on privacy and surveillance, I had students read Cory Doctorow’s short story “Scroogled” (in which Homeland Security is “powered by Google”) and it served as an excellent jumping off point for discussion. This Fall, I’m teaching a class on information ethics and policy, and I’ll be using science fiction as a tool to provoke critical thought. I’m in the middle of designing the class right now, and I would love some help identifying appropriate material. The general topics I’m covering in the class are: technology regulation and governance; freedom of speech; intellectual property; privacy and security; research ethics; AI & algorithms; access, inclusion, and power (inc. gender, bias, digital divide, etc. ); and consequences and responsibility. I’m particularly interested in short fiction because that’s easy to assign. And I have a great love for the genre. (Little known fact about me: I went to Clarion, have written some stuff, have published very little, but have a lot of good friends who are far more successful fiction writers than me!) But even I can’t read all of the short fiction I’d like to: hence this crowdsourcing effort! However, please do offer suggestions for novels, as I’d at least like to have a resource (Neal Stephenson’s Diamond Age or David Eggers’ The Circle, anyone?). Films and television episodes are also great (I think that both Star Trek and Black Mirror will get some play). Also, here is the (somewhat dry) catalog copy for the class. If you’re an upper division undergraduate or a graduate student at CU Boulder, consider taking it! It’s INFO 4601/5601: Ethical & Policy Dimensions of Information, Technology, and New Media. Explores ethical and legal complexities of information and communication technology. By combining real-world inquiry with creative speculation, students will probe everyday ethical dilemmas they face as digital consumers, creators, and coders, as well as relevant policy. The course will explore themes such as privacy, intellectual property, social justice, free speech, artificial intelligence, social media, and ethical lessons from science fiction. Please comment with any suggestions that you have! In addition to providing the name of the piece, include where to find it if applicable (e.g., online short stories are great! ), as well as a basic topic area that you think it applies to (e.g., AI, privacy, etc.). You don’t have to stick to just the topics I mentioned for the class – anything you think is relevant to technology or science ethics is awesome. I’ll also be compiling a resource list based on suggestions, and will share my completed syllabus for the class at the end of the summer. Sharing this post is appreciated! You’re also welcome to tweet suggestions at me. I put forth the novella “Labyrinth,” by Lois McMaster Bujold. It’s part of her sweeping space saga but it stands alone pretty well. The themes it deals with are genetic manipulation, the autonomy of bodies and our control of our own DNA. If you are created in a test tube, do you own yourself? If you are born with differences, abnormalities, disabilities, or enhancements, how far do you go to be “normal “? Should we even want to “fix” what genetics we are born with? There are many references to the overall series within, but it’s a great story on its own as well.